Speaker Isolation Module for 100V PA lines. To prevent PA loudspeakers in a secure area from being used as microphones, the Speaker Isolation Module SIM-Mk2 is installed within the secure area between an incoming 100V speaker circuit and the speakers to be secured. as the module does not require a mains supply or back-up batteries. Provides continuous monitoring of secure area speakers for fault conditions. Easy to install on existing wiring. Analogue technology. No RF emissions. Compact circuit board unit that can be mounted anywhere within the secure area. loss of power, loss of audio and open/short circuit faults. Any number of speakers up to 50 watts total load can be connected. 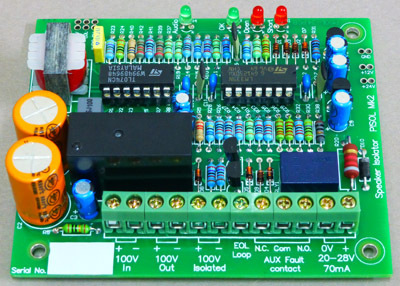 The isolation module utilises existing power supply from the Control Unit. Auxiliary contact on the fault relay. SIM-Mk2 and SIM-Mk1 are functionally identical except that the SIM-Mk2 has an additional uncommitted Auxiliary change-over contact on the fault relay for connection to other supervisory equipment. The SIM-Mk2 is slightly larger than the SIM-Mk1. All mechanical details are in the PDF files above. The Speaker Isolation Module (Model: SIM-Mk2) is guaranteed against defects in workmanship and materials for five years from date of delivery. Warranty does not cover finish or malfunction due to abuse or operation at other than specified conditions. Please contact Tyco Fire Protection Products for warranty terms and conditions. For sales enquiries, pricing, and orders, please contact our exclusive distributor.